Splendid Wake-up: Presidents Who Write Poetry? When one thinks of poetry in Washington, DC, I suppose one of the least likely places one would turn to would be the White House. But surprisingly some of the residents of the White House dabbled in poetry at some point in their life. George Washington wrote about the throes of love in his teenage years, but then many people attempt this during this period of their life. Fortunately for us the Library of Congress has kept track of most of these endeavors. Here is the beginnings of an acrostic Washington might have written about Frances Alexander. 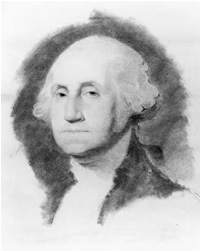 But it’s important to note that some scholars believe Washington might have lifted it from an undetermined source. I wasn’t surprised to read that Thomas Jefferson wrote some poetry; certainly he was well read. Here below is “A death-bed Adieu” which he wrote in bed during his final days of illness in 1826 for his daughter Martha Randolph. Then farewell my dear, my lov’d daughter, Adieu! James Madison wrote political satire in poetic form while he was at the College of New Jersey which is currently Princeton University. Madison’s poems are recorded in William Bradford’s notebook for the American Whig Society. Poetry is for lovers. Perhaps? John Tyler who courted and eventually married Julia Gardiner wrote and refined a ballad titled “Sweet Lady, Awake! A Serenade.” Once married in the White House, his wife Julia set the ballad to music. During his lifetime, he shared his poetry with friends and family, and poetry served as a balm for difficult periods of his life. Unless She had a man to help her. It appears that even during the Civil War, poetry kept Lincoln amused, as a verse which documents the North’s victory in the Battle of Gettysburg was written on July 18, 1863 and is in the collection titled “The Collected Works of Abraham Lincoln. Supplement, 1832-1865 (Westport, Conn: Greeenwood Press, 1974). Our current President Barack Obama has also dabbled in poetry while at Occidental College where he wrote two poems “Pop” and “Underground” in the 1982 issue of “Feast.” Though President Obama hasn’t kept up his poetry writing, he has incorporated poetry in presidential events such as his inaugurations as did President Kennedy, but President Obama has also had poetry events at the White House. Now that is poetry to my ears! !